Today in San Francisco, we made some exciting announcements about our company’s mobile first, cloud first approach. Office played a big part in today’s news. Over a billion people on the planet use Microsoft Office to get more done at work and at home. Every day we hear from you how important it is to have a great productivity experience on all the devices you use. We take that very seriously – we know that means you want the authentic experience of Office, made right for the device you’re using. Whether you’re creating an Excel spreadsheet on your tablet, authoring a Word document in the browser or making edits to a PowerPoint on your phone, you want the great Office experience you love, everywhere you are. 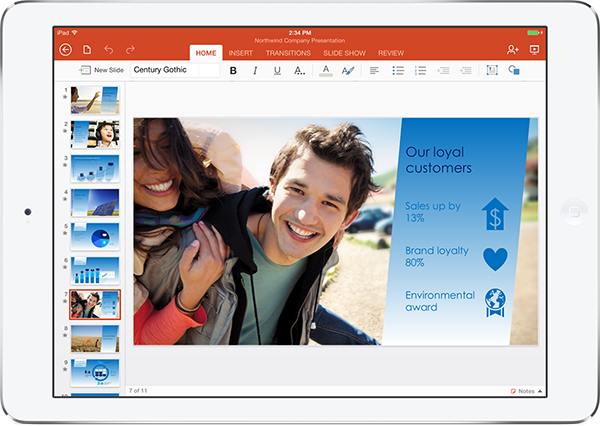 Today, we unveiled Office for iPad® – specifically Word, PowerPoint and Excel. But this isn’t simply Office on another device. We thought a lot about what people want to do when they’re on their tablet, iPad functionality, and touch-first when we were building Office for iPad. We reimagined Office on the iPad, while retaining what people love about Office. We hope you’ll be as pleased with the results as we are. In the future, we will bring Office apps to the Windows Store and other popular platforms. In addition to Office for iPad, we’ve gone a step further in our mobile first and cloud first approach, and like Windows Phone, we’ve now made Office Mobile for iPhone and Android phones available for free. You can read more about how we’re expanding Office across devices below. We know you’ve been wanting it, and starting today, you can download Word, Excel and PowerPoint for iPad from the App Store. 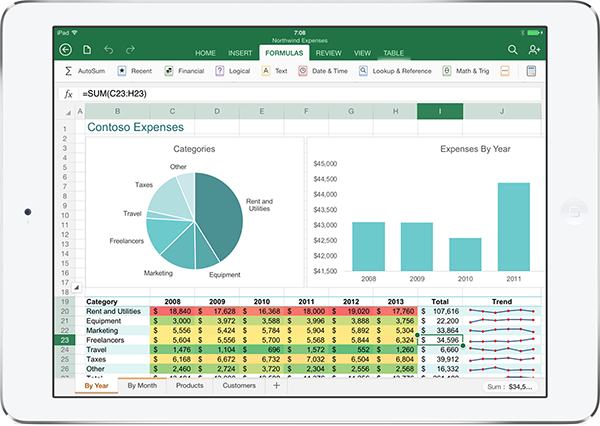 The apps have the robust capabilities and familiar look and feel that is unmistakably Office, while offering a fantastic touch experience built from the ground up for iPad. With the free versions of the apps, you can read your Word documents, view your Excel data and present with PowerPoint. Your documents will look as good as they do on your PC and Mac®, and better than ever on your iPad. 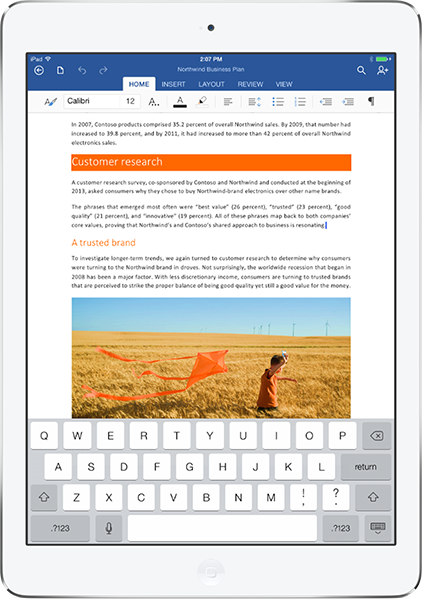 With an Office 365 subscription, you can edit and create new documents with the iPad. When you edit a document, you can be sure that content and formatting will be maintained across Office on PC, Mac, tablet and phone. And, you always have access to your up-to-date documents in OneDrive and OneDrive for Business. Office documents look better than ever on iPad. They look just as they do on your PC or Mac. In Word, images, tables, SmartArt, footnotes, equations are all there, perfectly formatted. Formulas, charts, sparklines, conditional formatting, and filters in Excel help you make better decisions. PowerPoint presentations pack a punch with transitions, animations, speaker notes and much more. When presenting, you can even use a built-in laser pointer, pens and highlighters to get your point across. A familiar Office experience designed for iPad. What makes these apps unique is that they strike just the right balance between being unmistakably Office and being designed for the iPad. If you use Office on a PC or Mac, the iPad apps feel very familiar, so you are comfortable and confident using these apps right away. The Ribbon layout and experience is familiar, with the most common commands under Home, and Chart commands automatically show up when you select a chart. At the same time, these apps were created from the ground up for iPad. The large touch areas on the Ribbon and in overlay menus make it simple to create, edit and format documents using only touch. Resize and rotate objects like pictures with touch-friendly handles. When you hold and move the objects, text flows smoothly around them. No keyboard and mouse required. You can even use iPad features like voice dictation to draft a Word document or AirPlay® to project a presentation wirelessly on a TV screen. Edit, create and collaborate with confidence. 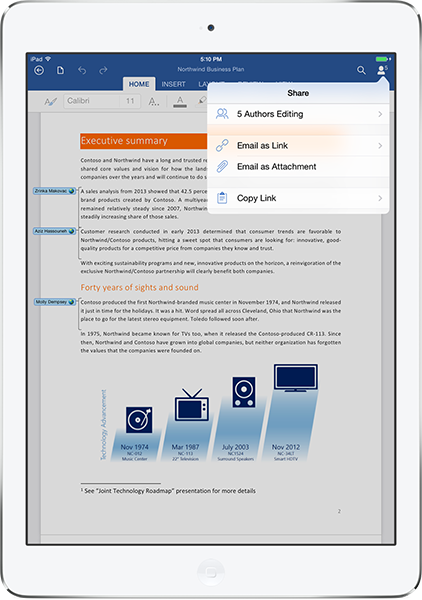 When you edit documents with the Office for iPad apps, you can be sure that you won’t lose any content or formatting. Documents will look exactly how you intended in Office on PC, Mac, tablet and phone – regardless of which device you used to make the edits. Moreover, the apps have a remarkably rich feature set to create beautifully designed documents. In addition, the apps make it easy to work together. Simply share your content with others thanks to OneDrive and then work simultaneously with multiple people on the same document or presentation. And, reviewing documents is now great on the iPad. Word documents can track changes, have threaded comments and easily accept or reject edits all right on the iPad. Made for the cloud and Office 365. Since people want to be able to get things done everywhere, the apps are seamlessly integrated with Microsoft’s cloud services. The apps let you access up-to-date documents in OneDrive, OneDrive for Business and SharePoint. It’s easy to pick up from where you left off, because the apps know what documents you were working on last, no matter what device you were using. Even if you don’t have an Internet connection for a while, you’ll still be able to work on the documents you’ve recently used on the iPad. Q: How much does Office for iPad cost? A: You can download the Office apps for free and read, view and present documents, spreadsheets and presentations. To get the full editing and creation experience, you need an Office 365 subscription. Office 365 gives you always-up-to-date versions of Office across your PC, Mac and iPad, and much more. Q: Can I try Office for iPad? A: Yes, you can read, view and present documents, spreadsheets and presentations for free. To get the full editing and creation experience, you can sign up for a free 30 day Office 365 trial at www.office.com/try. 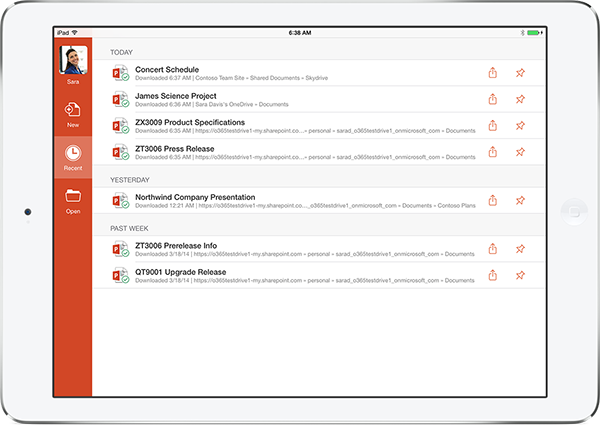 Then download the Office for iPad apps in the App Store. During your trial period, you can use Office across your PC, Mac and iPad. Q: What Office 365 subscription plans include Office for iPad? A: Office 365 Home, Office 365 Small Business Premium, Office 365 Midsize Business, Office 365 E3 and E4 (Enterprise and Government), Office 365 Education A3 and A4, Office 365 ProPlus, and Office 365 University. 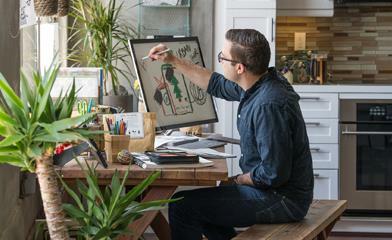 The new Office 365 Personal will also qualify when it becomes available later this spring. Q: What are the system requirements for Office for iPad? A: You need an iPad running iOS 7.0 or later. Q: What languages and markets is Office for iPad available in? A: We offer Office for iPad in the following 29 languages: Catalan, Croatian, Czech, Danish , Dutch, English, Finnish, French, German, Greek, Hungarian, Indonesian, Italian, Japanese, Korean, Malay, Norwegian, Polish , Brazilian Portuguese, Portuguese, Romanian, Russian, Simplified Chinese, Slovak, Spanish , Swedish, Traditional Chinese, Turkish, Ukrainian. As of today, Office for iPad is available in the following 135 markets: Albania, Angola, Anguilla, Antigua & Barbuda, Argentina, Armenia, Australia, Austria, Azerbaijan, Bahamas, Barbados, Belarus, Belgium, Belize, Benin, Bermuda, Bhutan, Bolivia, Botswana, Brazil, British Virgin Islands, Brunei, Bulgaria, Burkina Faso, Cambodia, Canada, Cape Verde, Cayman Islands, Chile, China, Colombia, Congo, Republic of, Costa Rica, Croatia, Cyprus, Czech Republic, Denmark, Dominica, Dominican Republic, Ecuador, El Salvador, Estonia, Fiji, Finland, France, Gambia, Germany, Ghana, Greece, Grenada, Guatemala, Guinea-Bissau, Guyana, Honduras, Hong Kong, Hungary, Iceland, India, Indonesia, Ireland, Italy, Jamaica, Kazakhstan, Kenya, Korea, Republic of, Kyrgyzstan, Laos, Latvia, Liberia, Lithuania, Luxembourg, Macau, Macedonia, Madagascar, Malawi, Malaysia, Mali, Malta, Mauritius, Mexico, Micronesia, Fed. States of, Moldova, Republic of, Mongolia, Montserrat, Mozambique, Namibia, Netherlands, New Zealand, Nicaragua, Niger, Nigeria, Norway, Palau, Panama, Papua New Guinea, Paraguay, Peru, Philippines, Poland, Portugal, Romania, Russia, São Tomé and Príncipe, Senegal, Seychelles, Sierra Leone, Singapore, Slovakia, Slovenia, Solomon Islands, South Africa, Spain, Sri Lanka, St Lucia, St Kitts & Nevis, St Vincent & Grenada, Suriname, Swaziland, Sweden, Switzerland, Taiwan, Tajikistan, Tanzania, Trinidad and Tobago, Turkey, Turkmenistan, Turks and Caicos, Uganda, Ukraine, United Kingdom, United States, Uruguay, Uzbekistan, Venezuela, Zimbabwe. Mac, iPad, and AirPlay are trademarks of Apple Inc., registered in the U.S. and other countries.